What a night that was as the Los Angeles Rams and New England Patriots advanced to Super Bowl 53, which will be played in Atlanta on Sunday February 3. There was high drama from start to finish as both Conference Championship games went into overtime for the first time in league history. There were a ton of big plays, a plethora of storylines and a fair share of controversy. So let's get stuck into the headlines from a fabulous final four Sunday in the NFL. Stop me if you have heard this one before but New England Patriots quarterback Tom Brady is simply brilliant - and in just under two weeks' time, he will play in a record ninth Super Bowl. That, to be frank, is just bonkers! 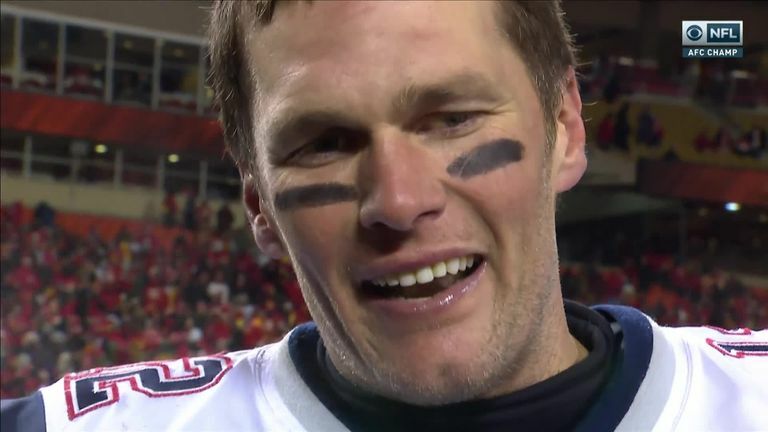 What makes Brady so great, in my mind, are two things we witnessed late in New England's 37-31 overtime defeat of the Kansas City Chiefs at Arrowhead Stadium. Tom Brady has made it to his ninth Super Bowl after the Patriots defeated the Chiefs 37-31 in overtime. With the game on the line and with his boyhood hero - former Chiefs and San Francisco 49ers legend Joe Montana watching on from the stands - Brady delivered time and again. Needing a touchdown to win in overtime, Tom Terrific converted on third-and-nine, third-and-10 and third-and-10 before handing off to Rex Burkhead for the winning touchdown. And then Brady looked like he had lost his mind. He was going mad on the field and celebrating like he had reached his first Super Bowl, not his ninth. It is that unquenchable passion, combined with deadly accuracy and production in the clutch, that makes Brady the greatest player (not just quarterback) that the league has ever seen. We will never see his likes again. At first glance, it might not look as if the New England Patriots had a good day on the defensive side of the ball as a wild fourth quarter meant that they ended up shipping 31 points to the Patrick Mahomes-led Chiefs. 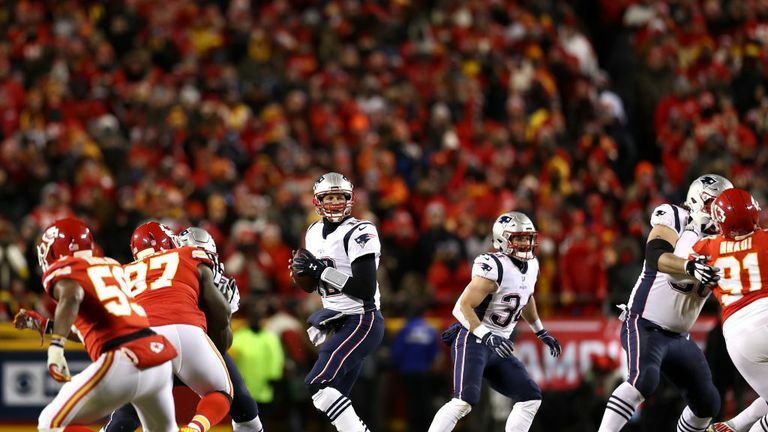 But I think Bill Belichick, along with soon-to-be-departing defensive coach Brian Flores, dialled up a masterful game plan that pressured Mahomes, kept him in the pocket and made life difficult in terms of connecting with his receivers, especially during a scoreless first half for the Chiefs. Highlights of the AFC Championship between the New England Patriots and the Kansas City Chiefs. Mahomes had his moments, especially in the second half, but the Patriots held Kansas City's high-powered attack to just 290 total yards with a lot of physical man coverage of the likes of Tyreek Hill, who caught just one pass for 42 yards. Belichick has produced some of the best defensive game plans in recent NFL history and, despite the final score, I think we can add this one to the list. And I think he is going to produce something very similar for the Rams and their attack in the Super Bowl. Watching the second half of the Los Angeles Rams' 26-23 defeat of the New Orleans Saints, I felt that the stage was huge and tough for their young quarterback Jared Goff - especially after he struggled in the first half. The Superdome crowd was deafening and a place in the Super Bowl was up for grabs. The stakes could not have been higher nor the situation tougher. And Goff responded, most likely without the help of expert play-caller Sean McVay because it looked like the quarterback could barely hear the head coach above the cacophony of noise. Goff threw for 114 yards and one interception for a rating of 55.0 in the first half but he stood tall after the break as he passed for 183 yards, a touchdown and a rating of 111.0. I thought that was a big-time display from the Rams' young quarterback and he showed the NFL he is ready for the Super Bowl stage. Highlights of the NFC Championship between the Los Angeles Rams and the New Orleans Saints. When the Los Angeles Rams announced that Todd Gurley was not injured during their NFC title game against the Saints, I was beginning to wonder if we were stumbling onto a 'Malcolm Butler benched in the Super Bowl' scenario. Gurley carried the ball just four times for 10 yards in the biggest game of his life. That was a shocking return from the league's All-Pro running back who scored 21 touchdowns during the regular season and who rushed for more than 100 yards the previous week against the Dallas Cowboys. But Gurley explained after the contest that his lack of involvement was a result of him playing "sorry as hell." I think there is a bit more to this story. Gurley did not look overly-happy at sharing his playing time with C.J. Anderson last week and I wonder why the Rams did not allow him to play his way out of last night's slump? I know the season was on the line and all that and there was no time for passengers. But this was, according to the voters in the United States, the best running back in the NFL this season. This is a story that is going to run and run in the lead up to Super Bowl 53. It is a shame that on a night of great plays and high drama, we have to talk about some blown calls and over-fussy officiating. In short, there was very little consistency and some of the calls and non-calls had too much of an impact when we would love for players to decide games. 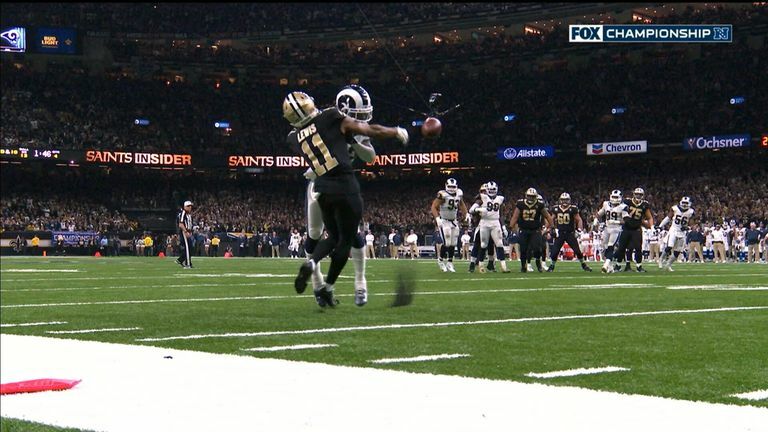 The biggest of all was what Saints head coach Sean Payton labelled a "Super Bowl call" as Tommylee Lewis was smashed to the ground on an incomplete pass by Nickell Robey-Coleman. You could have taken your pick on penalties - pass interference, hit to a defenseless receiver or even hands to the face. Nickell Robey-Coleman contacted Tommylee Lewis well before the ball arrived, but no flag was thrown. But no flags flew. The Saints still got their points on Will Lutz's 31-yard field goal, but they left time for the Rams to tie the game and then win it in overtime. 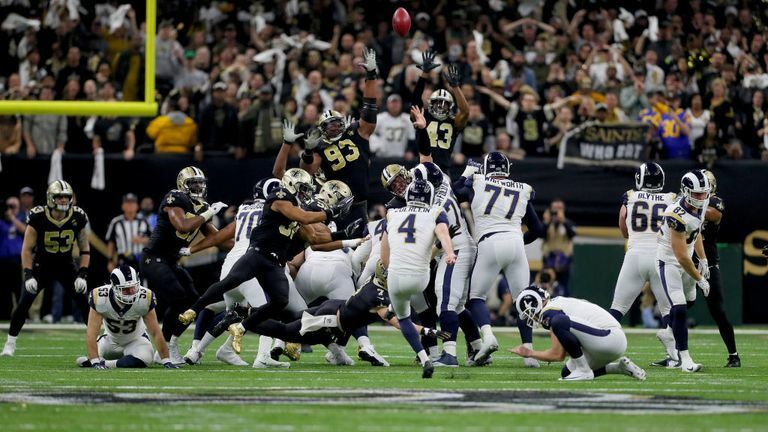 Had the penalty been given against the Rams, New Orleans could have run the clock down to just four seconds before kicking the winning field goal. There was more questionable officiating in the New England-Kansas City game. A roughing the passer penalty on Chris Jones against Tom Brady was simply ridiculous and a pass interference call against New England's J.C. Jackson was also harsh. That's not to mention the lengthy reviews of Julian Edelman's potential fumbled punt, Chris Hogan's catch/non-catch and Dee Ford's offside negating a game-winning interception for Kansas City (this was the right call, by the way). Either way, the officials were front and center far too often on Sunday night when the games should have been about the coaches and the players. The NFL rarely likes to change rules and when the league does, it normally comes as a result of some kind of controversy occurring on a big stage. I think Sunday night might lead to a lengthy conversation about a couple of rules in the offseason. First, I think pass interference will become a reviewable play. At least I hope it would after Sunday's debacle in New Orleans. The worry is that the review system will be slowed down further, but I don't think that would be the case because coaches should still only be allowed two challenges per half. And who would worry about another 15 minutes added to a game if the right calls get made? 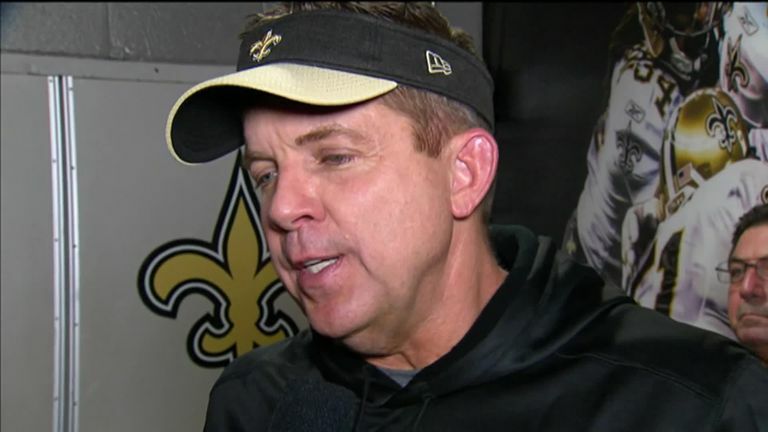 Sean Payton explains how the officials described what they thought happened when Robey-Coleman contacted Lewis and feels some of his players may never get over the incident. Second, I would like to see both teams given an opportunity to possess the football in overtime. The NFL went some of the way to amending the overtime rules a few years back but they didn't go far enough - a game can still be won if a team scores a touchdown on its first possession. New England won the coin toss on Sunday and given how both offenses were moving the ball in overtime, it was a big call to win. They marched straight down the field and won the game without Mahomes getting an opportunity to respond. It was the same in New England's comeback Super Bowl win over Atlanta in the 2016 season - reigning MVP Matt Ryan also never had a shot with the ball in overtime. I think that has to change and both teams need at least one shot with the football in the sudden-death period.